Hello everyone, and welcome to the week! It’s time once again for our look back at the noteworthy updates of the last seven days. Some cool updates from the big dogs and the small pups alike this week, with plenty to enjoy no matter what your tastes. Of course, you can keep an eye out for updates yourself using AppShopper Social (Free), the watchlist in the TouchArcade App (Free), or by participating in the TouchArcade forums, but this weekly summary is here to fill in the things you might have missed. Let’s dig in! Princess And Knight, $4.99 Team SoftIceCream has been hard at work on their 2.0 update for their strategy RPG Princess And Knight for a while now, and it’s finally arrived. This update addresses the main criticisms most had made of the game. There’s a new English translation that is considerably improved over the original, the portrait and event art has been replaced with more detailed and professionally-designed stuff, and even some of the sprites have received touch-ups. Under the hood, the engine has been recoded for 64-bit, helping to future-proof it. I imagine the developer will be going all in on developing the sequel now that this is finished. MARVEL Spider-Man Unlimited, Free With the hideously drawn-out Spiderverse cross-over finished, it’s back to business as usual for Gameloft’s stickiest runner. At last, the villain everyone has been waiting for has joined the scene: Silver Sable! Wait, you weren’t waiting for her? She’s pretty much the worst recurring Spider-Man villain ever? You have no idea why she shows up so often? Oh mirror, it’s like you know just what I’m going to say! Also in this update, new Spideys! Voice-overs for the previously awkwardly silent monstrous Spideys! More character slots! Achievement and collection counts! All this and more in this week’s winner of the coveted Update Mondays Most Spider-Mans Of The Week award! 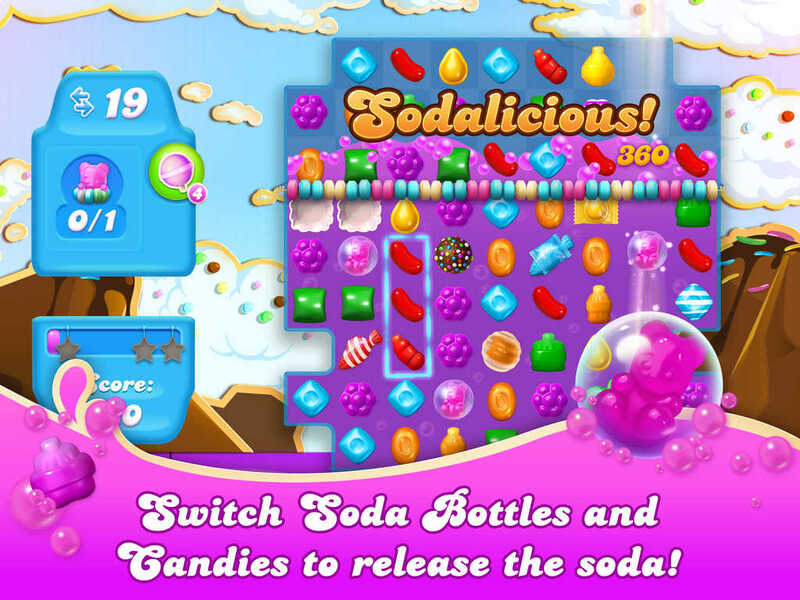 Candy Crush Soda Saga, Free Candy Crush Soda Saga piles on another 15 levels, this time taking place in the world of Carrot Cake, which I assure you goes awesome with the world of Cold Milk. These levels feature a new gimmick. Green soda will turn any candies matched inside of it into jelly fish. Yes, they’re the power-up most likely to make you tear your hair out as they fly off in search of anything but the square you want them to hit, but a power-up’s a power-up. Agent Dash, Free Wow, Full Fat wasn’t kidding when they said their new engine would allow them to update more quickly. In addition to a spiffy new icon, this version of the game has a remastered snow level with lovely new visuals, a new daily challenge where you can earn some free rewards, reduced loading times, and a few other bug fixes and optimizations. The developer is promising more to come, too. Bubble Witch 2 Saga, Free Stella has 20 new levels of bubble-bashing ahead of her as she enters the Golden Forest. It’s apparently a forbidden place, so of course she’s going to go there with her silly cats and no greater magic ability than that of being able to generate colored bubbles. I don’t want to be disrespectful to her or anything, but I know kindergarteners with better “magic" than that. It’s a wonder she’s survived 530 levels of this. SimCity BuildIt, Free In the new version of this SimCity spin-off, you can upgrade Dr. Vu’s Tower and earn three new disasters to play with: a tornado, a Tesla coil, and of course, a giant robot. There are also new road upgrades, social features, and achievements. Naturally, there are some bug fixes and adjustments, too. All in all, a pretty safe update after their geography goof a couple of months back. Paper Dungeons, $2.99 Paper Dungeons adds a new campaign to play through called “The Four Idols", with a new potion to unlock as a prize. The codex has been updated with 25 achievements, and ground loot, the most delicious of all loot, will no longer disappear when your bag is full. More important than that stuff is that the game now supports multitasking and 180 degree rotation. The former’s omission in the game’s initial build was absolutely baffling for an app launching in 2015, so I’m glad that’s been fixed. The developer has taken the opportunity to squash a few other bugs while they were at it. METAL SLUG DEFENSE, Free It’s been a year since SNK launched the surprise hit Metal Slug Defense, and they’re celebrating it in style. For a limited time, you can play a special event to win exclusive units, and logging in each day will earn you 15 medals a pop up to a maximum of 240. Everyone who plays at this time can also pick up a limited-time free unit, the Mini Mars People. With all that going on, let’s not forget that the King Of Fighters crossover is still going on, with the Legendary Wolves of Fatal Fury joining the fray this time around. You can pick up Terry Bogard, Andy Bogard, and Joe to fight your battles for you. There are even more new units and a new raid feature on top of all of that, too. Pocket Mine 2, Free Pocket Mine 2 adds some new social features and makes some UI improvements this time around, but the bigger news is the addition of a new island with some new artifacts. Titled Jelly Island, it seems like a natural place to go digging with a pickaxe for treasure. If it lives up to its name, you probably don’t need to pack much more than a spoon, my happy digging friend. Auro: A Monster-Bumping Adventure, $1.99 As updates go, Auro‘s latest is more of a tune-up than anything, but there are definitely a few cool things in here. First, the game now runs at 60 FPS. That may not be the most important thing for a strategy game, but I think it looks great, so I’m happy to see it. The developer has also improved the game’s tap detection to cut down on mistouches. A few bugs have been fixed, and the Brute has a new taunt. It seems like most of the little issues with the game have been addressed now, so it will be interesting to see where Dinofarm Games goes from here. 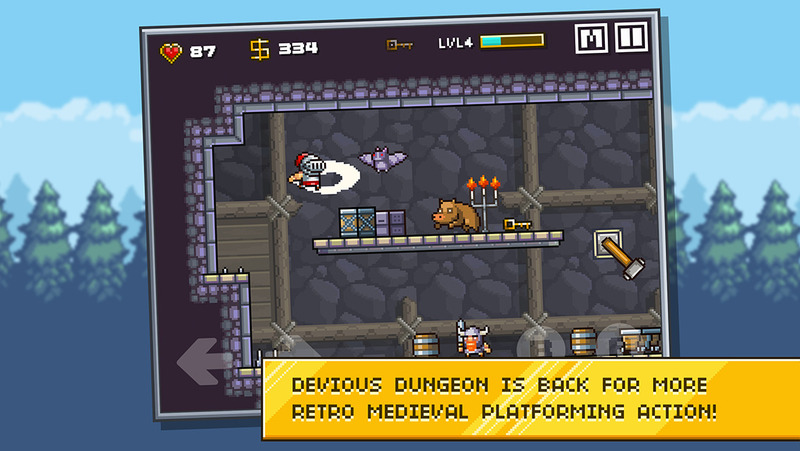 Devious Dungeon 2, $2.99 Devious Dungeon 2 is probably more cheeseburger than steak, but there’s nothing wrong with a cheeseburger sometimes. Certainly no one can argue that when you’re in a cheeseburger mood, bigger is better, and apparently Ravenous Games agrees. This latest update adds more content to the game including a new area with new levels, and some new gear to collect. It also says in the patch notes that some bugs were fixed, but I’ve still had some issues here and there. Hopefully this isn’t the last patch, but I imagine the developers are already hard at work on their next title. KingsRoad, Free Do you love events? If so, you’ll be pretty happy with KingsRoad‘s latest version. There are two events currently running. The Curse Of Ah’Kur (gesundheit!) runs until May 13th and pitches you against the herald of the mysterious Ah’Kur (gesundheit!). It’s your only chance to collect all of the pieces of the awesome Pharoah set, so get on it. The other event is the Bard’s Tournament, which presumably involves getting completely drunk and passing out on a bar stool while plucking the strings of a lute, trying to do a cover of Nirvana’s “Come As You Are“. Well, whatever it may be, it runs until June 1st, so you have a little bit of time to get it done. Apparently you can win a belt, an odd prize for an event celebrating the job class who presumably spend the most time with their pantaloons around their ankles. CSR Classics, Free The CSR games are all about the cars. I mean, they kind of have to be because the racing action is about as involved as a video game golf swing. This new update adds Alfa Romeo to the game, with four cars representing the brand. The Montreal, the GTAm, the Giulia Sprint, and the TZ2 are all now available for you to work towards. They look gorgeous, naturally. Gangstar Vegas, Free Apparently the world is ending in Gangstar Vegas, or something. The important thing is, MFi controller support has been added. Yes, now those of you who are holding out on updating because you don’t want the F2P elements have a hard choice to make. This update also includes new exoskeletons and vehicles connected to the apocalypse theme, and some new gang emblems. Oh, it’s because of that new Mad Max movie, isn’t it? Well, I guess that makes sense. Carry on then, Gangstar Vegas. Pyramid Solitaire Saga, Free I’ve long held that the most exciting parts of Pyramid Solitaire Saga‘s story happen off-screen in the update notes, and this one is no exception. On-screen: 20 new levels of hot solitaire action. A new screen where you can check your boosters. Off-screen? Helena is diving into a sunken ancient ceremonial boat to retrieve a key hidden at its altar. By playing cards, naturally. What will the key open up? I mean, more levels, but I’m excited to read the narrative behind it! Glorkian Warrior, $2.99 Here’s a nice update to a very fun game. Glorkian Warrior, an ode to Galaga and its ilk, gets two new enemy invaders, a new environment to play in, a flamethrower weapon, and a new ace difficulty setting that should prove a powerful test to even the highest-ranked Glorkian Warriors. That difficulty level comes with its own leaderboard for you to fight amongst each other on. I’m just glad that we finally get to see the Glorkian Homeworld. It is truly majestic, my friends. DomiNations, Free DomiNations is probably one of the better free-to-play strategy simulation games, though it certainly has some baggage. The newest version allows you to change your nation on the fly via a revolution. Who doesn’t enjoy a good revolution now and then? That is, besides the bourgeois pigs, am I right, mes amis?. You can also change your Wonders if one of them isn’t quite working out for you. Kind of weird to treat Wonders like reusable stickers, but that’s the miracle of the modern age for you. Lamp And Vamp, $1.99 It’s a small but significant update for Lamp And Vamp. The titular Vampire can now continue from the beginning of the stage if he gets killed, making it easier to reach the castle. The challenge now is to see how long you can last once you do reach the castle. I’m not sure how I feel about this change. Lamp And Vamp was already pretty easy for the type of game that it is, and this change makes it even easier. I guess it now works really well for an entry-level player who wants to get into rogue-lites, at least. 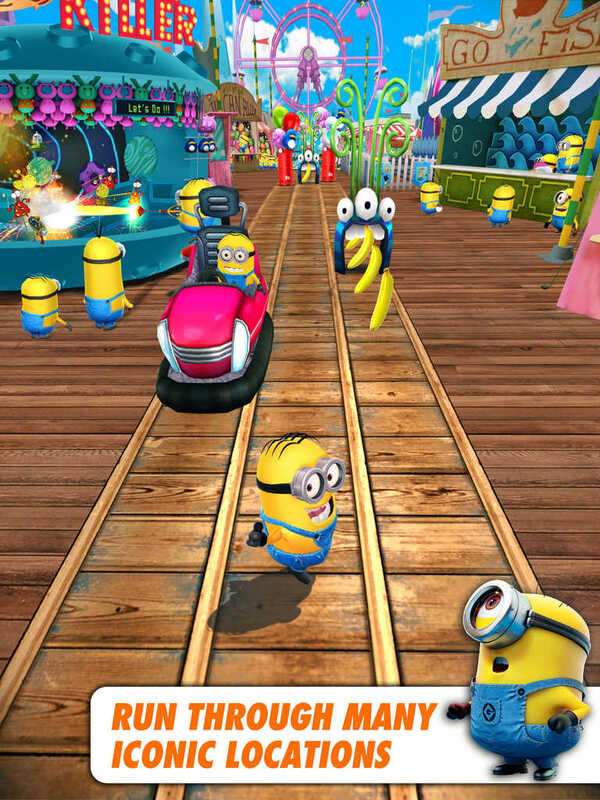 Minion Rush, Free When it Minion-rains, it Minion-pours. It wasn’t long ago that we finally got a second Minion in the game, the somehow-different Carl, but here we are with a third Minion, Jerry, who is somehow different from both of the other guys. I think he’s more round? Well, anyway, Jerry’s power-ups last longer, so he’s probably the best. There’s also a new event marking the spring season, a new mini-game, and an allegedly hilarious new video starring Jerry. I will be the judge of that, Mr. and/or Mrs. Gameloft! Boom Beach, Free Boom Beach has been a big success for Supercell, a developer who clearly picks their shots carefully. The latest version sets up a few new events, including one featuring a new villain, Colonel Gearheart. In terms of new content, you can now build a Prototype Weapons Lab where you can create some wild experimental defenses. A new Gunboat ability has been added that can throw a wrench in your opponent’s plans, too. You’ll need to make good use of both to take on the two new operations that have been added to the game. Add in some UI improvements and a few bug fixes and you’ve got one beaching update. Can I say that? Call of DutyÂ®: Heroes, Free Look, some people might say this is just a naked copy of Clash Of Clans, but I disagree wholeheartedly. Anyway, this update adds Cla- er, Alliance Wars to the game, allowing you to pit your alliance against others across a multi-day event. There are also some UI improvements, particularly with regards to alliances, and some new quests and achievements to play for. Also, new decorations for your base! While you’re putting up some new pretty ribbons or whatever, you might want to clean up the spring debris. You can earn free celerium by doing it. What exactly “spring debris" is, I’m not sure. Flower petals? Rabbit poo? SHREDD, Free Formerly known as dEXTRIS, the gorgeous and challenging SHREDD has finally answered the requests of players by adding IAP to the game. No, really, stay with me here. You can now pay to remove the ads from the game. Or you can pay a little more to instantly unlock all the themes you normally need to work very hard to get. As an added bonus, this IAP also has four special themes you can’t otherwise get, and a random theme switcher that adds some spice to your game. There’s also support added in for Kamcord Video Replays so you can share your pain more easily. Also added: the wonderful, mysterious, and ever-appreciated stability and performance improvements. Plants vs. Zombiesâ„¢ 2, Free Plants Vs. Zombies is six years old. Wow, how about that! To celebrate, its somewhat less-loved sequel is running a special birthday event until May 14th where you can get a free World Key, take out special birthday zombies, and win gems every single time. Plus, limited-time costumes for your plants! I can’t remember the exact procedure here. Do we pour one out? Make a toast? They’re undead, after all. Oh well, you pick whether you want to drink it or spill it, I’ve got other fish to fry. harâ€¢moâ€¢ny 2, $3.99 Who wished for 100 new levels for HarDOTmoDOTny 2? Whoever it was, your wish has been granted by the lovely App Store Genie. These super-hard new levels bring the total up to a whopping 1,000. Take that, King! This is a game I like to take out now and then to chill a bit, but I’m always up for rage-inducing levels, too. It’s like sweet and sour, you know? Vainglory for iPhone, Free This new update to Vainglory brings Hero Skins to the game. No, they are not a disgusting cannibal version of potato skins. What’s wrong with you? Instead, they’re new themes for your heroes that you can unlock through various means. So far, there are six skins added, with skins for the remaining heroes coming in further updates. This new update also makes numerous performance, UI, and balance improvements, all while heroically squashing a ton of bugs.